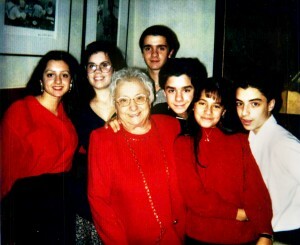 L ouiseAntinoro was born into an Italian family and was one of 13 children. With a strong respect for education, a talent for designing and making dresses, and a passion for cooking, Louise was an amazing mother of four children and wife to her husband Anthony. Louise is a great reminder of an immigrant woman who came to America to create a loving, prosperous life for herself and the generations to follow, much like many of the women who we serve each day. In small pan, sauté sliced garlic and pepper flakes until garlic turns yellow. Toss in the chopped tomatoes and simmer for 30 minutes. Ten minutes before the sauce us done, toss pasta into boiling water until done. Drain paste and toss in sauce. Mix and Serve, and top with grated cheese, if desired.